The Last Pass is a remarkable and fascinating portrait of Bob Cousy, his family, and the Boston Celtics Dynasty. In preparation for writing this book, Gary Pomerantz spent 53 hours interviewing Cousy and countless additional hours over several years in research and interviews of teammates and friends. Bob Cousy joined the Boston Celtics of the National Basketball Association (NBA) in 1950 even though he was not drafted by the Celtics. The new Celtics coach, Red Auerbach, with the first overall pick, drafted a center by the name of Chuck Share. Cousy was drafted third by the Tri-Cities Blackhawks but came to the Celtics through a series of complex circumstances, or what might be better termed “blind luck.” The Celtics literally picked his name out of a hat. Cousy played 13 seasons in Boston. From the 1956–57 season through the 1962–63 season, the Celtics won six of seven NBA Championships. The keys to those championships were Cousy, Bill Russell, the center, and Red Auerbach, the coach. After Cousy’s retirement, the Celtics were NBA champions in five of the next six years. Chuck Share did not sign with the Celtics, and he never played a game for them. Bob Cousy’s parents were immigrants from France, and he is bilingual. Growing up in poverty in Manhattan and Queens, he had his first contact with basketball on the city playgrounds, and he also competed in community and church leagues. As a junior in high school, he played on his school team for the first time and soon emerged as a very special player with superb ball handling skills. He was recruited by Boston College and Holy Cross College, choosing the latter. He led Holy Cross to national prominence and a number-one national ranking. His fame in New England and New York grew. In his first five years with the Celtics, Cousy transformed the style of guard play, put the Celtics on the national sports map, and was one of the founders of the NBA Players Association. The creation of the Celtics basketball dynasty was triggered by the arrival of Bill Russell as the Celtics center. Russell proved to be the greatest big man to date and, combined with the guard play of Cousy, transformed the Celtics from a good team to a dominant one. The early years of the relationship between Cousy and Russell, involving both ego and race, receive close scrutiny and are a major thread in this story. For those seeking a recounting of these early years of the Celtics dynasty, there are ample game descriptions, especially the playoff struggles for the five NBA titles. Cousy’s final season (1962–63) in Boston is related in some detail, with the focus on Bob Cousy Day at Boston Garden, as well as, Cousy’s drive to finish his career with one more NBA championship. The subtext of these final few seasons is the Civil Rights Movement and the spotlighting of racism in Boston. Bill Russell looms large in this aspect of the story as well. The final chapters of The Last Pass, in many ways the most complex and interesting chapters, feature Cousy’s retrospective on his own life as he reaches age 90. 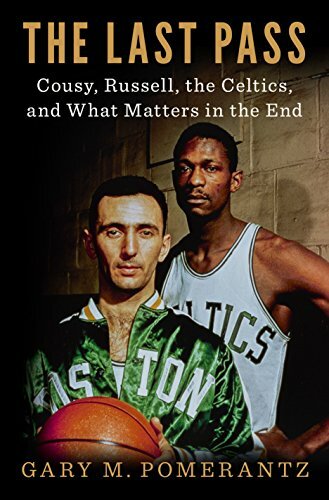 Bob Cousy offers a well-balanced assessment of his own strengths and weaknesses, the meaning of fame, the importance of family, and his feelings of regret and guilt surrounding his relationship with Bill Russell. Cousy repeatedly expresses these feelings, and wonders what he should have done, or might have done, differently in reference to Russell and the culture of racism in Boston and in America. Some may find Cousy’s obsession with his relationship with Russell overdone, but the repetition does drive the point home. In the end, Pomerantz has created a fascinating and sympathetic portrait of a superstar athlete whose human sensitivities are on display and whose complexities are laid bare. Along the way Bill Russell, Red Auerbach, and three generations of the Cousy family, fill in many of the details of a long and fruitful life. In short, this is a moving story of a public man and his private doubts whose long life and self-examination should be an inspiration to all.